This document covers Height Fog and its uses. It assumes that you have a level already set up in which you would like to add Height Fog. For more information on setting up a level, see the Creating Levels page. The one layer version of height fog was added in QA_APPROVED_BUILD_JUNE_2007. Before that, the four layer version was always used and there was no performance benefit to using less than four layers. In the Actor tab of the Generic Browser, select the HeightFog Actor, which is under Info. Right-click in the world and select Add HeightFog Here. Open the HeightFog Properties by either double-clicking the Actor; right-clicking on the newly-placed Actor and select Properties; or pressing F4. Positioning the HeightFog Actor will determine the height of the HeightFog. To animate Height Fog, use Matinee to animate the HeightFog Actor values. For more information, see the Matinee User Guide page. Create a group in Matinee with that Actor attached. Create a color property track in the above group. A dialog should appear letting you choose which color property to interpolate. There should be only one option since the HeightFog Actor has only one property that is a color. Once that track is set up, you can place keyframes and use the context menu (right-click) or the Curve Editor to set the color for each key. Transparency can't be handled during the main fog pass so it is a special case. Fog on transparent objects is calculated per-vertex, which means that transparent meshes need to be reasonably tessellated to look right. Materials using modulative blending can't be fogged, unless they are decal materials. Height Fog is rendered with a full screen pass blended onto the scene color. There is a one layer version and a four layer version. These are applied based on how many HeightFog Actors exist in the level, so if there is only one actor the one layer version will be used. The four layer version takes about twice as long to render as the one layer version, so use just one HeightFog Actor if possible. There is also a small performance gain to be had from setting the Start Distance so that nearby objects in the world are not fogged at all. Use FogVolumes to have localized fog effects. This feature can also be faked by using sheets of unlit translucency and special materials. See the Volumetric Lighting Guide for information on setting up a volumetric lightbeam. 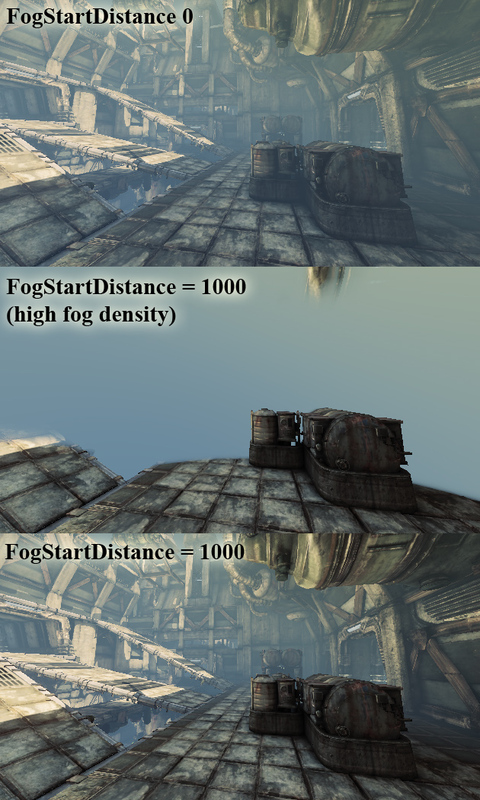 The FogStartDistance can be used to artificially keep some defined area in front of the viewer without fog. This also helps performance as pixels can be culled by the z buffer. 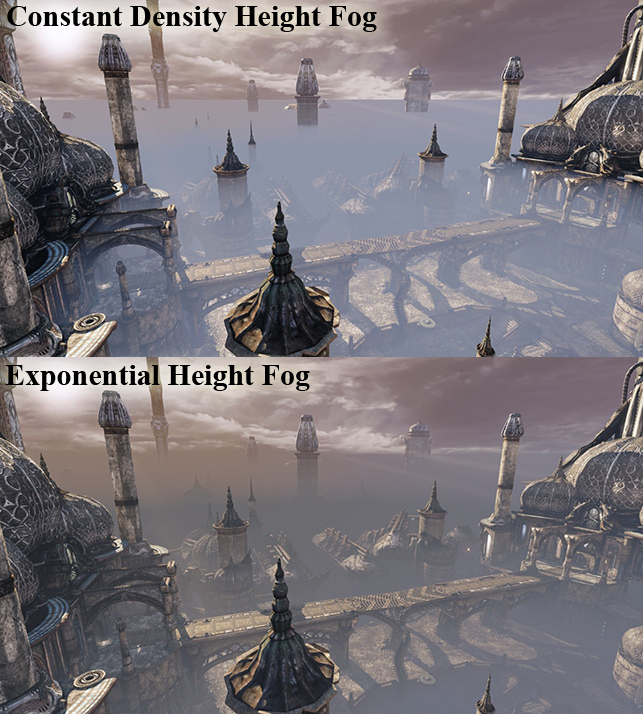 Depending on the scene content and when using a far fog start distance the rendering cost can be 50% or less. This optimization is implemented by rendering a full screen quad that has a z value and depth test enabled. They are helpful to test existing levels and to find a good start distance. Use the ? as parameter to get more help.